When most people hear the word blockchain, they think Bitcoin. In the near future, they’ll also think digital marketing. In fact, some people are already giving the connection between blockchain and digital marketing some serious thought. 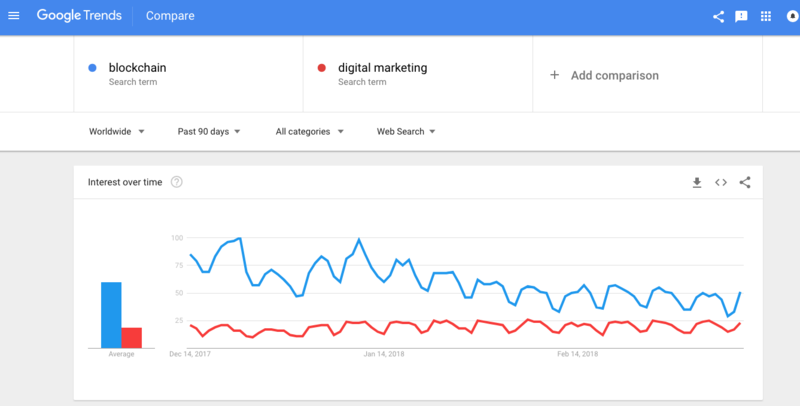 Since December 2017, search interest in blockchain has increasingly shown a positive correlation with digital marketing, as well as the potential to converge with search interest in digital marketing. 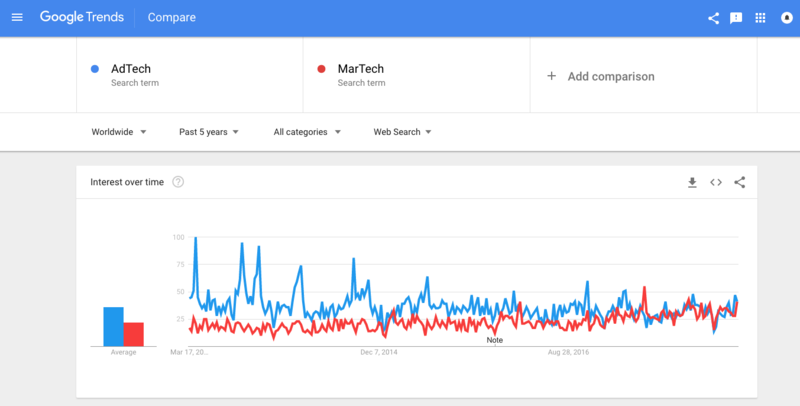 These trend lines appear similar to the the trend lines of search interest in MarTech and AdTech, which converged over a period of 5 years. So why do digital marketing and blockchain appear to be approaching convergence right now? Because the trend is still developing, it’s difficult to say. But Jeremy Epstein might have an answer next week. 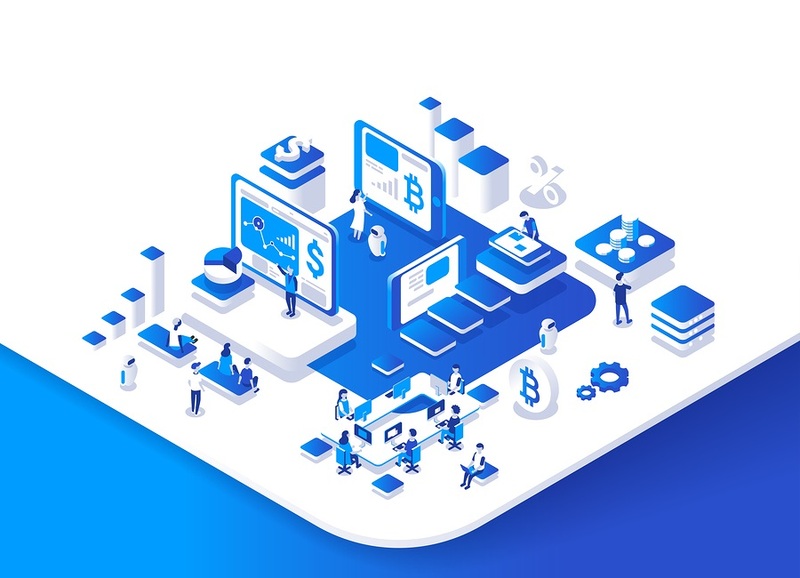 One possible reason for the convergence of blockchain and digital marketing can be found by examining other industry trends. 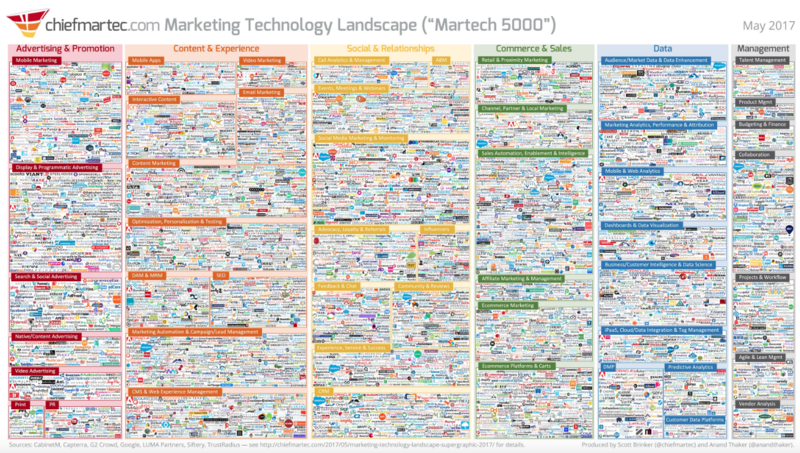 Over the past five years, literally thousands of martech enterprises have been developed, which has gotten some people to see adtech as just another form of marketing technology (i.e., two sides of the same coin). And as people have started thinking of adtech and martech as two sides of the same coin, they’ve also started seeing how that coin could have greater currency if each side complimented and worked to enhance the value of the other. According to Joe Stanhope, VP and Principal Analyst at Forrester Research, adtech and martech are converging for these economically advantageous reasons, which spell the potential to drive both “economic throughput” and “contextual marketing” at the same time—i.e., the opportunity to package industry unity, healthier bottom lines, and increased reach all in one. Cash-On-Cash Return On Investment (COC Return) This is the pre-tax, year-end cash flow divided by the actual amount of the original investment. COC is used to compare your investment with other options, excluding factions such as the use of leverage (mortgage), taxes, appreciation over time and mortgage pay-down over time. As time goes on and your investment goes well due to tenants paying their rent as they should and the home increasing in value due to inflation and market appreciation, COC becomes less relevant. Sophisticated investors compare COC with other investments to determine the highest and best use for their liquidity going into an investment, whereas ROE is used once the investment is owned. If you received an 8% COC return for four years (for example, $8,000 per year on a $100,000 investment for each of five years = $40,000) and exited the property via a sale at end of year five for a gain of $60,000, your annualized return would be a total of $100,000/five years, or 20% a year. This is calculated with $40,000 in cash flow plus the $60,000 due to the general appreciation of the property. Return On Equity (ROE) One of the few downsides of real estate investing is that your investment is illiquid unless you sell or refinance the asset. General appreciation from the market. Say you had a great investment kicking off 20% COC a year. As an investor in real estate — or any other asset — consider your return on equity as a means to evaluate the highest and best use for your capital so you can make adjustments to your portfolio over time.